Grr…. Do you know what’s not fun? Unpacking a nice CSA box and taking a picture of it and thinking about how lovely and abundant it looks and then finding out I didn’t get two of the things I was supposed to get. And one of those was potatoes. And we all know how much I love potatoes. I am feeling really cranky now. This is absolutely not the first time this has happened either. Money is a bit tight right now, and getting shorted on my CSA box is NOT helping me feel easeful about the expense. Happy Bastille Day! Let’s celebrate victory over tyranny with some fresh produce! I don’t mean to be off the cuff about it. Tyranny is still being felt all over the world in so many forms, including right now in France with the racist political maneuvering of the burqa ban. At any rate, my Bastille Day box was gorgeous, with one notable exception. Truly beautiful corn and plums – perfect for any independence day celebration, whether here or abroad. Pre-vegan days I would have made clafoutis with the plums, kicking off a summer’s worth of stone-fruit clafoutis. Doing a quick Food Blog Search for “vegan clafouti” I found several interesting recipes using silken tofu or chia seeds, so I may have to give them both a shot. It just isn’t summer without clafoutis. The one major disappointment in my box this week was the bag of green grapes. They were mushy and tasted of mold, throughout the entire bag. I had to toss the whole bunch straight into the compost. What a shame! I’ve enjoyed so many fresh grapes lately (plus I’m not partial to green grapes in general) so this bunch was going to go into the freezer for a most delicious, decadent summer dessert/snack. Ah well, I will take the advice of the French (Marchons! Marchons!) and move on from the disappointing grapes to the yummilicious rest of my box. For instance, I tried one of my tomatoes today. I didn’t have high hopes for it because it was a pallid, unassuming little fellow. But the flavor it packed took me back to my childhood, to the time when tomatoes were treasures and their taste exploded with summer. It has been a crazy, crazy month. Super busy, mostly eating out and Amy’s and grabbing little bites here and there. No menu planning, no trips to the store, a week out of town… But then this morning I rushed out the door only to discover my CSA box sitting on the stoop. I’d forgotten about it completely, so finding it there was like getting a magical visit from the Food Fairy. Suddenly there was fruit, there were vegetables. There was food again in my house! The first thing I made was an Epic Salad. That’s a salad that starts out as, “Hmm… nice lettuce in my box today, maybe I’ll make a salad,” and ends up with more and more wonderful ingredients tossed in. 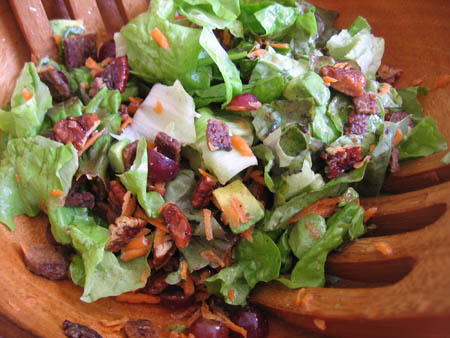 This one ended up as leaf lettuce, tempeh bacon, spiced pecans, grated carrots, avocado, and red grapes. It was truly epic! Well, the awesome energy that was propelling my previous MPM stuttered to something of a halt last week due to fatigue, an abundance of social activity and the poor customer service of Eating with the Seasons (in other words, no more CSA box)*. So here’s another retroactive menu plan that harkens back to those glory days where we were actually making lots of new Moosewood recipes and eating fabulous meals every night! After you’ve taken a look at the menu, please check out the announcement for this month’s Sugar High Fridays event. This is a super fun and incredibly long-running sweets event, and I have the honor of hosting this month’s round. If you like sweets (and who doesn’t?) won’t you cook up something fun and join us? This week’s Gluten Free Menu Swap is being hosted over at lovely Gluten Free Goodness. For a huge compendium of Menu Plan Mondays, visit the giant list at I’m an Organizing Junkie. *For those who care, here are the reasons why we quit Eating with the Seasons: Mostly it was an issue of style. EWTS was more of an online delivery service, with a huge list of produce to choose from each week, much of it coming from farms far to the South or North of here. 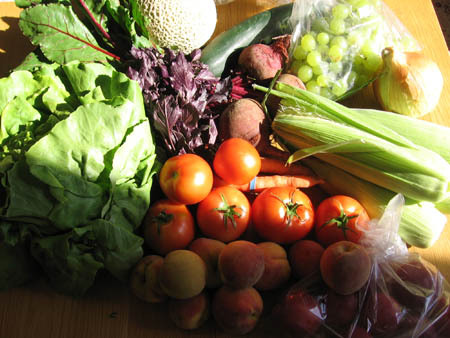 Two of the main reasons we get a CSA box are so we can be more connected to specific farmers who grow our food and so we can eat locally and in season. It didn’t really feel like that was being facilitated by the EWTS box. But the capper was the poor customer service we received. The people we spoke to on the phone never seemed well informed about the CSA service, which was frustrating. 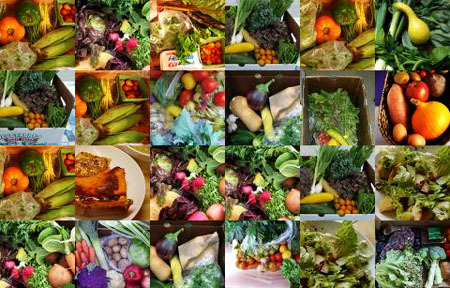 Finally, we wanted to put our box on hold as we do periodically to check back in and make sure getting a CSA box is still the right choice for us. When I called to find out if we could do this, we were told that we would be purged from the EWTS membership and probably would not be able to get back in later. The way this was presented was as a kind of threat to keep us from putting our box on hold. (Of course it had the immediate effect of making me want to quit rather than just take some time off.) When I spoke to someone else there later, they had no idea what I was talking about and assured me we would remain EWTS members forever and could resume whenever we wanted. I hate to think that there’s one confused and/or nasty person spoiling the customer service for EWTS, but it was definitely a series of frustrating interactions! 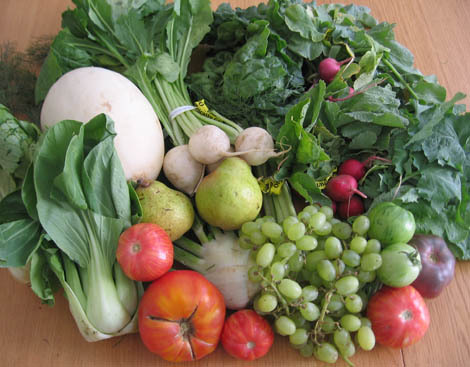 We’re going to try a different CSA soon, one that is more connected to a specific farm. Well, this is it, my friends. One full year has gone by since I began my CSA experiment. Today I picked up my last box, and a beautiful box it was. I still believe very much in the CSA model, and I hope that this isn’t the end of community supported agriculture in my life. But for now, this box, this farm, this system, isn’t working with my life. It was a hard summer from the box – fruit that was underripe or mushy and tasteless, watery tomatoes that rotted in a day, and Duck and I found ourselves groaning every week when it was time to go pick up our box, instead of being eager to see what new treats were in store. I know more of the vegetables and fruits that I love will be coming now that it’s fall, so the decision to stop getting a box wasn’t based on summer’s disappointments, but the disaffection I was feeling towards the box after this summer certainly made it easier to just not renew my subscription when it ran out this week. A lot has changed in my life since last October. I don’t live alone anymore, for one thing, and a lot of the time and energy I once spent cooking new and wonderful things to use up unfamiliar or unloved ingredients goes instead towards building a home together and just being with the person I love. I’ve also gotten much, much more tired. I’ve mentioned on here in the past that I have chronic fatigue syndrome, and my energy level in the last few months has declined so greatly that I’ve had weeks where I barely get out of bed. This means more take-out, more cans of soup, and more Duck cooking. He’s a wonderful cook but the challenges and constraints of a CSA aren’t a pleasure for him the way they were for me, so it makes more sense to have him pick his own choice of ingredients from the farmer’s market. I feel sad, and I feel guilty. Getting a CSA box and fully committing myself to this project gave me a taste of some things I value deeply: community, sustainability, drastically reduced waste and fuel consumption, a chance to honor more directly the great service of the folks who grow my food. It seems crazy to cut myself off from these benefits, just because it’s inconvenient or not as shiny and exciting as it used to be. On the other hand, I also deeply value taking care of myself, which means being realistic about my time and energy, and also preparing food that feels nourishing and energizing. Right now that seems to be leaning more towards the Japanese spectrum of cuisine (I feel a new project coming on!) so I want to respect that and see where it takes me. Last week I took Duck to the Oakland Airport and on my way home I stopped at Berkeley Bowl. I spent a couple of hours in there, roaming the aisles and luxuriating in the produce section, buying daikon and lotus root and tender Japanese cucumbers. None of this was organic, and I have no idea where it was from or who grew it or how it got from farm to my cart. But I felt excited about cooking again for the first time in a while. I guess what I’m trying to articulate is that there’s a balance between all these factors and values and pleasures, and I am feeling my way along it, bit by bit. And I may swerve to one side or another as I go, but if I don’t let myself play on all sides of the line I won’t really find a grounded place to stand. I’ll just be rigidly holding myself in the spot I’ve intellectually decided is the “right” one. I listen to these radio cooking programs and I’m aghast when people casually discuss eating imported Italian tomatoes or meat, cheese and eggs that must have been factory farmed, or talk about coffee without holding a bottom line of fair trade. I don’t understand how their passion for food can just totally trump their concerns for the environment and the welfare of people and animals. But on the other hand if I have to deal with another five bunches of turnips I swear I will throw up or shove them straight into the compost, because food without passion is just a grinding slouch towards bare sustenance. So I will keep walking the line, experimenting to find the balance, paying attention to this relationship I have with food, one of the most tender and passionate relationships I know, and seeing where it wants to take me. Below are the contents of my final box. Because I’ve been so tired the past couple months I have many recipes I still want to try to post about, so I may be catching up on the backlog from previous boxes in the days to come. There’s another project brewing as well, though whether that will live here or in its own blog I have yet to decide. For all of you who joined me on my CSA adventure – I have loved getting to know you and sharing ideas with you, and I hope we can continue to share recipes, techniques, and philosophical musings for a long time to come! Maybe it’s just that summer’s not my favorite season, produce-wise. Maybe my lifestyle has changed more than I can perceive, now that two cooking styles are comingling in one kitchen. Whatever the reason, Duck and I are talking about not renewing our box. The past few months have been monotonous, and not in a good way. (Good monotony, of course, goes: kale. kale. kale.) I don’t like tomatoes all that much, unless they are truly stunning. The tomatoes from Eatwell have not been. I find the heirlooms watery and tasteless, and they rot within two days. (I know they are picked at the peak of ripeness, and if I liked them in general, I would be glad to do what I had to to not let them spoil – either eat them straight away or preserve them. But since they don’t taste like much, I generally don’t muster the energy until it’s too late.) The Shady Ladies have been tasty, and a few have been very good. The Romas we had in this week’s box are just awful, but then, Romas generally are. (Last night, on The Splendid Table, Lynne Rosetto Kasper called Romas “the eunuchs of the tomato world.”) The cherry tomatoes have been pretty good, and this week we got a huge batch, which is nice for snacking. The other two things we’ve seen a lot of have been potatoes and zucchini. The potatoes have been wonderful – small, tender, and gorgeously pink, in the case of the Huckleberries, or creamy yellow, in this week’s Yellow Finns. The zucchini has been fine. It lasts a long time in the fridge, isn’t too watery when cooked. But you know, it’s zucchini. It doesn’t have a lot going on. And now to the fruit. Earlier this summer we were getting apricots and cherries and then plums and pluots. The apricots were okay, the cherries were quite good. The plums and pluots were inedible. Tasteless, mealy – after one bite the whole batch would go in the compost. Now we’re getting peaches and nectarines. These have been good, but the peaches invariably arrive bruised, and the quantity is so small (maybe two nectarines and a peach, say) that we have to go to the farmer’s market right away anyways. I love the concept that is community supported agriculture, the idea of giving reliable financial support to the necessary and extremely valued people who grow our food. I think Eatwell is a very good farm – their growing practices seem responsible, their manager-worker relationships seem respectful and fair. (Although I don’t think I want to eat eggs anymore that come from chickens who are killed after two years. I have found other, albeit less convenient, places to source eggs from chickens who live more natural lifespans.) And the whole point of CSA-style relationships between farmers and consumers is that farmers can experiment and learn and go through disasters and medfly quarantines, and still know they’ll have an income, even if the plums are mealy or the tomatoes are quarantined. Because this is the bottom-line reality of our food system: If no one took the risks to grow the food, there would be nothing to eat. Organic and sustainable and ethical and biodynamic and all that may seem like a luxury (which they aren’t really, in the long run), but food itself is not. The burden of producing a necessary commodity under variable and uncertain circumstances (no widget factories to make our fruits and veggies) should not have to be entirely assumed by the producer. I really believe this. I am, in fact, quite passionate about it. But I’m just not enjoying my box very much these days. For many months it was a special treat every time it arrived. I couldn’t wait to unpack it, photograph it, lovingly store away my food and start planning recipes and menus. Now I feel cranky at having to go pick it up, and tired at the idea of stuffing everything into a fridge already overflowing with radishes and turnips. When I go to cook, I reach for my farmer’s market vegetables, and I have to make an active effort to use box items. Also, honestly, I’m sure part of this has to do with personality, which I wish were irrelevant, but is in fact highly influential. If I had had some super awesome interactions with the people of Eatwell farm, instead of a kind of awkward and off-putting one, I would probably feel much more personally invested and that would weigh in heavily on the side of continuing this relationship. On the Eatwell side of things, their CSA is completely full with a waiting list, and they just won “Best of the Bay” for CSAs, so my dropping out won’t change things for them. It’s just a question of whether or not I want to still have this in my life. One thing that’s kind of a bummer is that, for the second week in a row, the strawberries just don’t taste that good. In our newsletter this week Nigel wrote about the challenges of picking perfectly ripe strawberries that will survive the truck ride to San Francisco, and also wrote, “we are trying to grow produce that tastes like you picked it from your own garden.” I remember the taste of strawberries from my garden growing up. I usually don’t bother buying them at the store or farmer’s market unless they have at least a hint of that really intense sweetness. The two baskets I’ve had so far from my box are pleasant enough – certainly not unripe – but not even of the caliber I’d take home with me from the supermarket. It makes me wonder if the variety they are growing just isn’t that sweet or something. Well, I’m super excited to go to Strawberry Day at the farm – I’m sure I’ll have many more opportunities to talk (and taste!) and figure out what the story is.